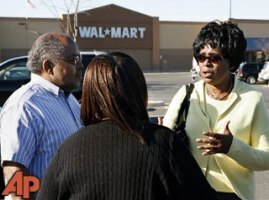 The announcement was as clear as day: “Attention, Walmart customers: All black people, leave the store now.” The question is, who said this announcement and why? That’s what Walmart (and local officials) wants to know after an announcement was made at their Washington Township, New Jersey, location commanding that black people vacate the store. Of course, instantly afterward a manager got on the loud speaker and apologized, but did not offer an explanation. Do I think Walmart made this racist announcement? No, not at all. Walmart has worked hard at improving its racial relationships, and has worked hard to build its brand in black and Hispanic communities in the US. I think some employee was goofing around and made that announcement by accident. Or, at worst, some prankster Walmartian got into the phone system and hit the code for the intercom. It’s nothing to go on a rampage over.